GoPro Hero7 - Has GoPro finally got its Mojo back? 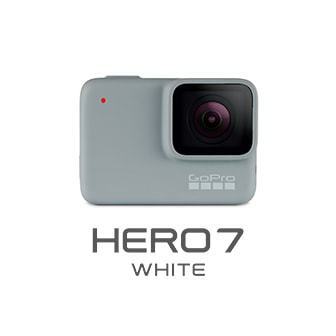 You are at:Home»Gear»Video Cameras»GoPro Hero7 – Has GoPro finally got its Mojo back? Let’s face it, at one time, GoPro was the undisputed king of the action cam segment. Everywhere you looked, there were adrenaline junkies with a GoPro attached to just about anything they could stick them on. But then, as the marketplace became more crowded with cheaper alternatives with similar features, GoPro seemed to lose some of its “Mojo” and dare we say it, even start to stumble. However, with last year’s release of the Hero6, GoPro seemed to gain a little momentum back and now with the announcement of not one, but three versions of the Hero7, GoPro might be set to retake the action camera throne once again. 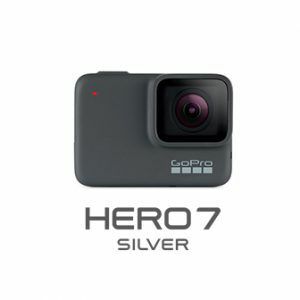 The Hero7 is available in three different versions, the HD White, the 4K Silver and the fully loaded 4K Hero Black. As mentioned above, the White version is the most basic of the three options. It will allow you to capture full HD 1080p/60fps video, 2x slo-mo capture speed and 10-megapixel photos. When shooting stills, you can capture in portrait or landscape formats and the burst mode captures 15fps. It’s waterproof up to 10-metres, has touchscreen control for simplified settings (including touch zoom) as well as up to 14 different hands free voice control options. You can also share your stories right away using QuikStories via the GoPro App on your mobile device. What it doesn’t offer is a removable battery, GPS tagging or the more powerful GP1 Processor found in the Black version. The Silver version is the middle of the three options and the starting point for 4K video in the lineup. With the Silver version you can capture 4K/30fps or Full HD 1080p/60fps video, 2x slo-mo capture speed and 10-megapixel photos. When shooting stills, you can capture 10MP WDR image in portrait or landscape formats or in the 15 fps burst mode. The WDR (wide dynamic range) feature means you’ll be better able capture images in situations where there is a challenging combination of bright light and shadow. The Silver version also offers GPS tagging allowing you to track your speed, distance and more and then add that information to your videos via stickers when using the GoPro app. Like the White version, what it doesn’t offer is a removable battery or the more powerful GP1 Processor found in the Black version. The Hero7 Black does everything that the White and Silver versions do plus a whole lot more! With the Black version, you’ll be able to capture 4K/60fps video, 8x slo-mo and 12-megapixel HDR and RAW format stills. But, perhaps the most exciting change is the addition of what GoPro is calling “HyperSmooth” stabilization. Like the similar feature found on the previous Hero6, the new “HyperSmooth” feature on the Hero7 utilizes digital rather than optical stabilization to achieve gimbal like smoothness when shooting action. However, unlike the previous model, it works in the 4K/60fps mode. The HyperSmooth feature also works with another new timelapse mode called TimeWarp which takes photos at regular intervals and then stitches them all together to giving you rock steady results. Other upgraded features include: removable battery, voice control (with 16 available commands), SuperPhoto (HDR), Face, Smile and scene detection and finally live streaming allowing you to share the action as it’s happening via your smart device.